There are a string of notable eateries on Lancashire Court, a darling little stretch off Bond Street right in the heart of Mayfair. There is Rocket, which serves decent and affordable Italian, namely pizzas; Hush, which is owned by Roger Moore’s son, Geoffrey Moore; and Mews of Mayfair, a unique bar (ground floor), restaurant (first floor) and lounge/club (basement) experience that stretches over three floors. The restaurant has recently undergone a refurbishment. Where it was once all shiny, white and a little harsh looking, it is now bathed in softer tones and exudes a warmth that is both charming and stylish. I liked the makeover – the new look makes it the kind of restaurant that you could easily settle into for a classy night out. And enjoy we did. 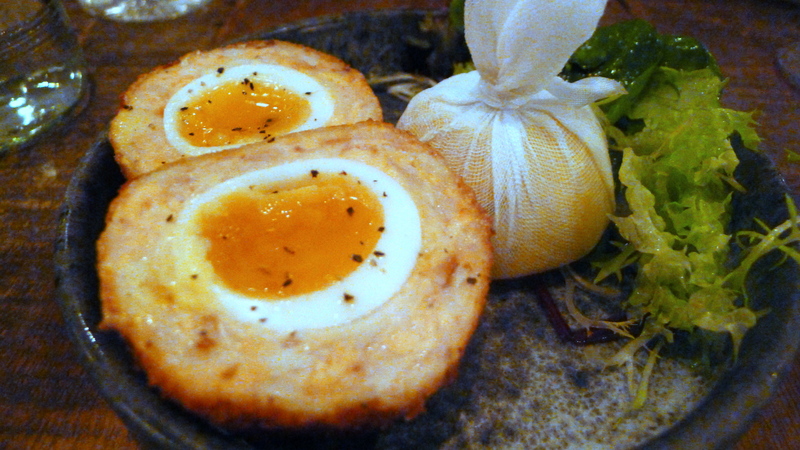 A smoked haddock scotch egg (£4.50) was remarkably good. Although not particularly smoky, the haddock was flavoursome and moist, and the egg, showed off a shiny golden yolk that had been perfectly cooked to a runny yumminess. I would have happily eaten more. A starter of scrambled hen eggs with shaved truffle (£16) was also delightful. 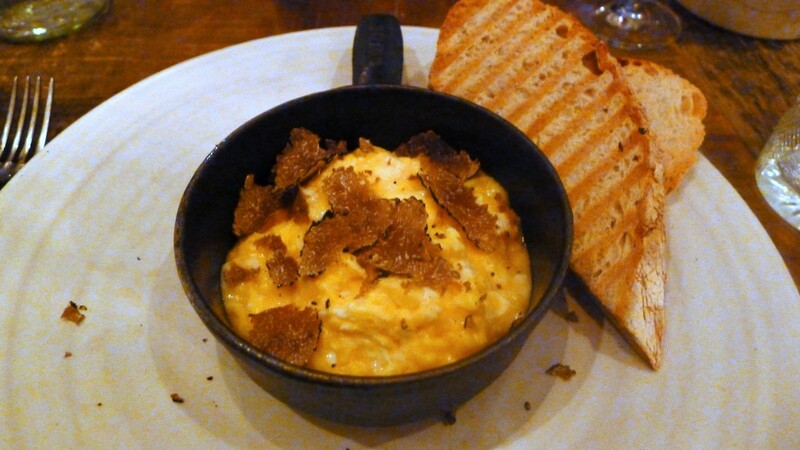 The eggs were deliciously creamy, and the truffles were aromatic and went wonderfully with the egg. A dish as rustically satisfying as this was always going to be hard to beat. 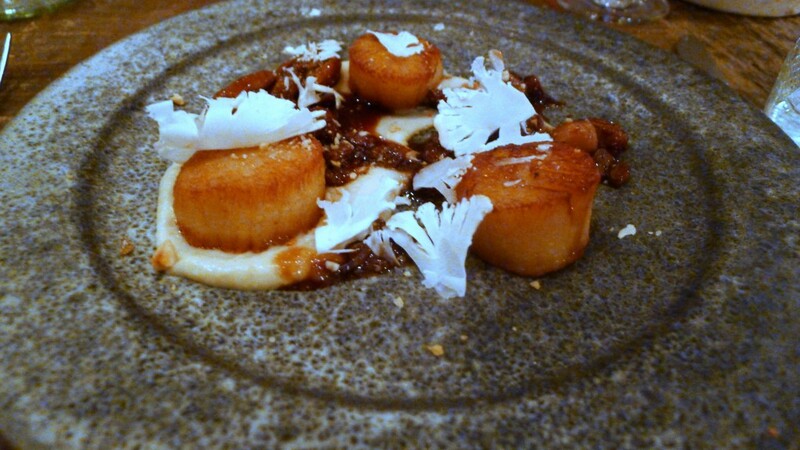 Hand-dived Rye scallops with cauliflower and sultanas (£12.50) were well seasoned and nicely cooked with an opaque centre. With its gentle flavour, the cauliflower purée was a wonderful match for scallops, although I found the use of sultanas a little odd in the dish. It worked well enough, but the sultanas would not have been my first choice for pairing with scallops. 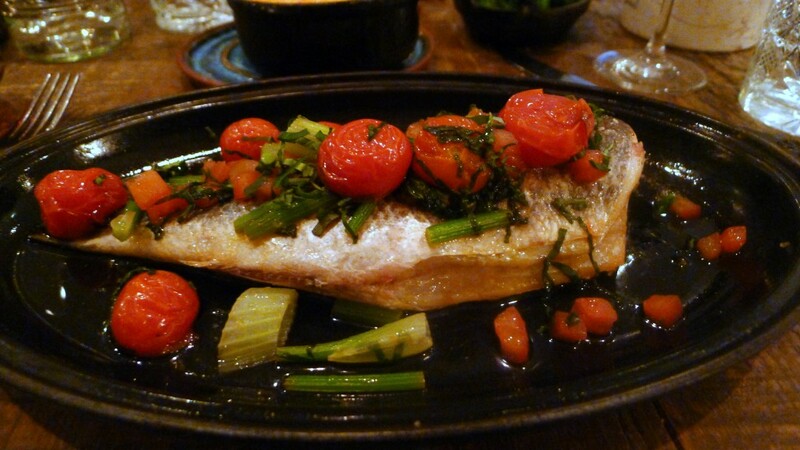 Grilled whole seabass with lemon and mixed herbs (£27) was really nicely done. The fish was fresh and this shone through in both the flavour and the firmness of its flesh. It was moist, and the various herbs and tomatoes that came with it rounded off the fish nicely. Mews cheeseburger with hand cut chips (£14.50) was tasty and filling. The patty proved very moist and the chips were fat and crispy. A simply, yet satisfying dish. I also enjoyed a side of Mews champ (£3.50) hugely. Creamy and potato-y, it bagged loads of flavour with the use of spring onions. It was a touch salty, but it was very enjoyable nevertheless. 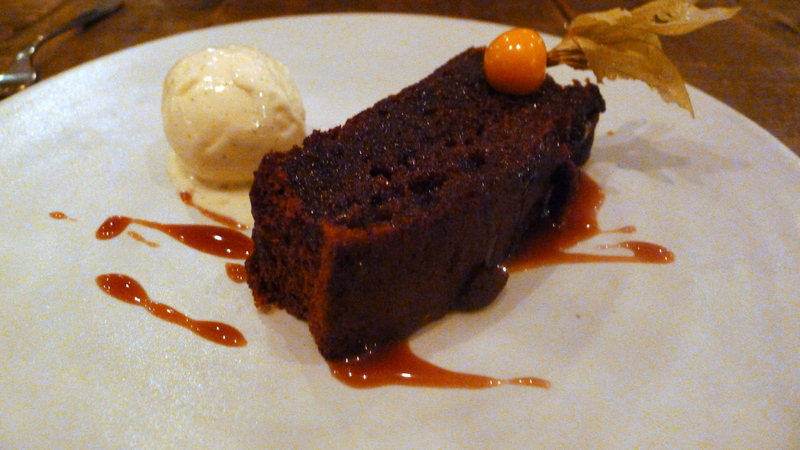 A dessert of sticky toffee pudding with toffee sauce and vanilla ice cream (£5) proved to be a good effort. However it was short on toffee sauce, that special something that would have really made this dessert. Consequently, the pudding was a little dry. 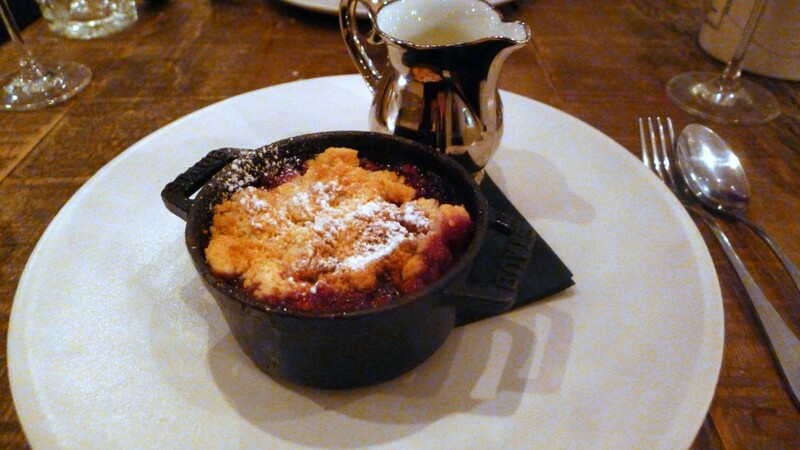 An apple and blackberry crumble (£5) had hints of ginger running through it which was a great touch. However, it was bit too sweet, and the crumble wasn’t crumbly enough. And the custard, although tasty, was a bit runny. I really enjoyed the Mews of Mayfair. 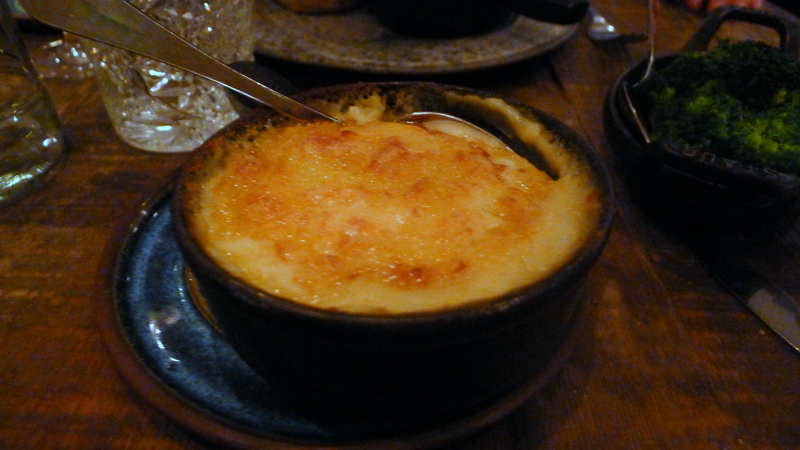 There was a lovely effervescence to the restaurant that was really endearing. The food was accomplished and well executed, although the desserts could have done with a little tweaking. As for the service, it was thoughtful and charming without being overbearing. The restaurant at Mews of Mayfair makes for a very nice evening out. Price range: £20 to £58 for three courses. Excluding drinks and service.